This is “Nature and Form of Commercial Paper”, chapter 19 from the book The Law, Corporate Finance, and Management (v. 1.0). For details on it (including licensing), click here. Here we begin our examination of commercial paper, documents representing an obligation by one party to pay another money. You are familiar with one kind of commercial paper: a check. Understand why commercial paper is an important concept in modern finance. Be familiar with the historical development of commercial paper. Recognize how commercial paper is viewed in economics and finance. Because commercial paper is a vital invention for the working of our economic system, brief attention to its history and its function as a medium of exchange in economics and finance is appropriate. Commercial paper is the collective term for various financial instruments, or tools, that include checks drawn on commercial banks, drafts (drawn on something other than a bank), certificates of deposit, and notes evidencing a promise to pay. Like money, commercial paper is a medium of exchange, but because it is one step removed from money, difficulties arise that require a series of interlocking rules to protect both sellers and buyers. To understand the importance of commercial paper, consider the following example. It illustrates a distinction that is critical to the discussion in our four chapters on commercial paper. Lorna Love runs a tennis club. She orders a truckload of new tennis rackets from Rackets, Inc., a manufacturer. The contract price of the rackets is $100,000. Rackets ships the rackets to Love. 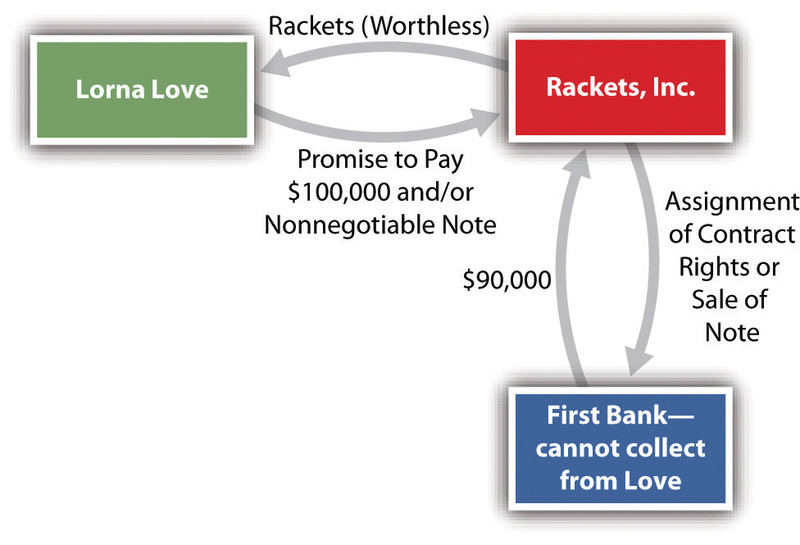 Rackets then sells for $90,000 its contract rights (rights to receive the payment from Love of $100,000) to First Bank (see Figure 19.1 "Assignment of Contract Rights"). Unfortunately, the rackets that arrive at Love’s are warped and thus commercially worthless. Rackets files for bankruptcy. Now let us add one fact: In addition to signing a contract, Love gives Rackets a negotiable note in exchange for the rackets, and Rackets sells the note to the bank. By adding that the note is negotiable, the result changes significantly. 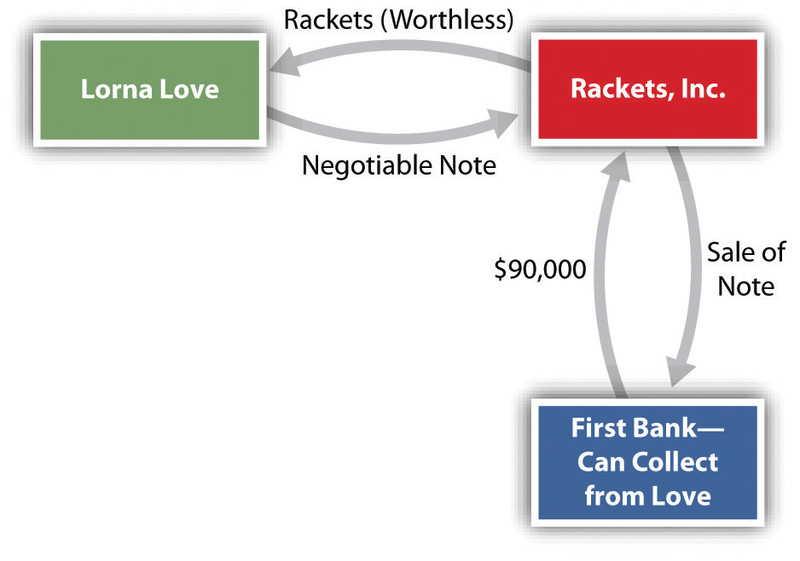 Because the note is negotiable and because the bank, we assume, bought the note in good faith (i.e., unaware that the rackets were warped), the bank will recover the $100,000 (see Figure 19.2 "Sale of Negotiable Note"). The key to the central role that commercial paper plays in modern finance is negotiabilityTransferable from one person to another by delivery or by delivery and indorsement.. Negotiability means that the paper is freely and unconditionally transferable from one person to another by delivery or by delivery and indorsement. (“Indorsement,” not “endorsement,” is the spelling used in the UCC, though the latter is more common in nonlegal usage.) Without the ability to pay and finance through commercial paper, the business world would be paralyzed. At bottom, negotiability is the means by which a person is empowered to transfer to another more than what the transferor himself possesses. In essence, this is the power to convey to a transferee the right in turn to convey clear title, when the original transferor does not have clear title. Is the paper negotiable? That is, is the paper in the proper form? We explore that issue in this chapter. Was the paper negotiated properly? See Chapter 20 "Negotiation of Commercial Paper". Is the purchaser of the paper a holder in due course? See Chapter 21 "Holder in Due Course and Defenses". Does the maker of the paper have available any defenses against even the holder in due course? See Chapter 21 "Holder in Due Course and Defenses". In most transactions, especially when the first three questions are answered affirmatively, the purchaser will have little trouble collecting. But when the purchaser is unable to collect, questions of liability arise. These questions, along with termination of liability, are discussed in Chapter 22 "Liability and Discharge". Finally, in Chapter 23 "Legal Aspects of Banking" we examine other legal aspects of banking, including letters of credit and electronic funds transfer. Negotiable instruments are no modern invention; we know that merchants used them as long ago as the age of Hammurabi, around 1700 BC. They fell into disuse after the collapse of the Roman Empire and then reappeared in Italy around the fourteenth century. They became more common as long-distance commerce spread. In an era before paper currency, payment in coins or bullion was awkward, especially for merchants who traveled great distances across national boundaries to attend the fairs at which most economic exchanges took place. Merchants and traders found it far more efficient to pay with paper. Bills of exchange, today commonly known as drafts, were recognized instruments in the law merchant. (The “law merchant” was the system of rules and customs recognized and adopted by early-modern traders and is the basis of the UCC Article 3.) A draft is an unconditional order by one person (the drawer) directing another person (drawee or payor) to pay money to a named third person or to bearer; a check is the most familiar type of draft. The international merchant courts regularly enforced drafts and permitted them to be transferred to others by indorsement (the legal spelling of endorsement). By the beginning of the sixteenth century, the British common-law courts began to hear cases involving bills of exchange, but it took a half century before the courts became comfortable with them and accepted them as crucial to the growing economy. Courts were also hesitant until the end of the seventeenth century about sanctioning a transferor’s assignment of a promissory note if it meant that the transferee would have better title than the transferor. One reason for the courts’ reluctance to sanction assignments stemmed from the law that permitted debtors to be jailed, a law that was not repealed until 1870. The buyer of goods might have been willing originally to give a promissory note because he knew that a particular seller would not attempt to jail him for default, but who could be sure that a transferee, probably a complete stranger, would be so charitable? The inability to negotiate promissory notes prevented a banking system from fully developing. During the English Civil War in the seventeenth century, merchants began to deposit cash with the goldsmiths, who lent it out at interest and issued the depositors promissory notes, the forerunner of bank notes. But a judicial decision in 1703 declared that promissory notes were not negotiable, whether they were made payable to the order of a specific person or to the bearer. Parliament responded the following year with the Promissory Notes Act, which for the first time permitted an assignee to sue the note’s maker. Thereafter the courts in both England and the United States began to shape the modern law of negotiable instruments. By the late nineteenth century, Parliament had codified the law of negotiable instruments in England. Codification came later in the United States. In 1896, the National Conference of Commissioners on Uniform State Laws proposed the Negotiable Instruments Act, which was adopted in all states by 1924. That law eventually was superseded by the adoption of Articles 3 and 4 of the Uniform Commercial Code (UCC), which we study in these chapters. In 1990, the American Law Institute and the National Conference of Commissioners on Uniform State Laws approved revised Article 3, entitled “Negotiable Instruments,” and related amendments in Article 4. The revisions clarified and updated the law. All states except New York and North Carolina have adopted Articles 3 and 4. State law governing commercial paper is vulnerable to federal preemption. This preemption could take two major forms. First, the Federal Reserve Board governs the activities of Federal Reserve Banks. As a result, Federal Reserve regulations provide important guidelines for the check collection process. Second, Article 3 of the UCC can be preempted by federal statutes. An important example is the Expedited Funds Availability Act, which became effective in 1988 (discussed in Chapter 23 "Legal Aspects of Banking"). Federal preemption may also become intertwined with international law. In 1988, the United Nations General Assembly adopted the Convention on International Bills of Exchange and International Promissory Notes. Progress on the treaty emanating from the convention has been slow, however: the United States, Canada, and Russia have approved the convention (in 1989 and 1990) but have not ratified the treaty; Gabon, Guinea, Honduras, Liberia, and Mexico are the only countries to have ratified it. Commercial paper is defined more narrowly in finance than in law. To the corporate treasurer and other financiers, commercial paper ordinarily means short-term promissory notes sold by finance companies and large corporations for a fixed rate of interest. Maturity dates range from a low of three days to a high of nine months. It is an easy way for issuers to raise short-term money quickly. And although short-term notes are unsecured, historically they have been almost as safe as obligations of the US government. By contrast, for legal purposes, commercial paper includes long-term notes (which are often secured), drafts, checks, and certificates of deposit. Commercial paper is a medium of exchange used like cash but safer than cash; cash is rarely used today except for small transactions. The key to the success of this invention is the concept of negotiability: through this process, a person can pass on—in most cases—better title to receive payment than he had; thus the transferee of such paper will most likely get paid by the obligor and will not be subject to most defenses of any prior holders. The law of commercial paper has developed over the past four hundred years. It is now the Uniform Commercial Code that governs most commercial paper transactions in the United States, but federal or international preemption is possible in the future. Commercial paper is important in both economics and finance. If there were no such thing as commercial paper, real or virtual (electronic funds transfers), how would you pay your bills? How did merchants have to pay their bills four hundred years ago? What is it about negotiability that it is the key to the success of commercial paper? How could state law—the UCC—be preempted in regard to commercial paper? A sight draftA draft or bill that is payable on demand or upon presentation. Also called demand draft. calls for payment “on sight,” that is, when presented. Recall from Section 19.1 "Introduction to Commercial Paper" that Lorna Love wished to buy tennis rackets from Rackets, Inc. Suppose Love had the money to pay but did not want to do so before delivery. Rackets, on the other hand, did not want to ship before Love paid. The solution: a sight draft, drawn on Love, to which would be attached an order bill of lading that Rackets received from the trucker when it shipped the rackets. The sight draft and bill of lading go to a bank in Love’s city. When the tennis rackets arrive, the carrier notifies the bank, which presents the draft to Love for payment. When she has done so, the bank gives Love the bill of lading, entitling her to receive the shipment. The bank forwards the payment to Rackets’ bank, which credits Rackets’ account with the purchase amount. A time draftDraft (bill of exchange) payable to a third party on a specified or determinable future date., not surprisingly, calls for payment on a date specified in the draft. Suppose that Love will not have sufficient cash to pay until she has sold the rackets but that Rackets needs to be paid immediately. The solution: a common form of time draft known as a trade acceptance. Rackets, the seller, draws a draft on Love, who thus becomes a drawee. The draft orders Love to pay the purchase price to the order of Rackets, as payee, on a fixed date. Rackets presents the draft to Love, who accepts it by signing her name. Rackets then can indorse the draft (by signing it) and sell it, at a discount, to its bank or some other financial institution. Rackets thus gets its money right away; the bank may collect from Love on the date specified. See the example of a time draft in Figure 19.3 "A Time Draft". Assume Love, the importer, is in New York; Rackets, the exporter, is in Taiwan. Rackets is willing to permit Love to pay ninety days after shipment. Love makes a deal with her New York bank to issue Rackets’ bank in Taiwan a letter of credit. This tells the seller’s bank that the buyer’s bank is willing to accept a draft drawn on the buyer in accordance with terms spelled out in the letter of credit. Love’s bank may insist on a security interest in the tennis rackets, or it may conclude that Love is creditworthy. On receipt of the letter of credit, Rackets presents its bank in Taiwan with a draft drawn on Love’s bank. That bank antes up the purchase amount (less its fees and interest), paying Rackets directly. It then forwards the draft, bill of lading, and other papers to a correspondent bank in New York, which in turn presents it to Love’s bank. If the papers are in order, Love’s bank will “accept” the draft (sign it). 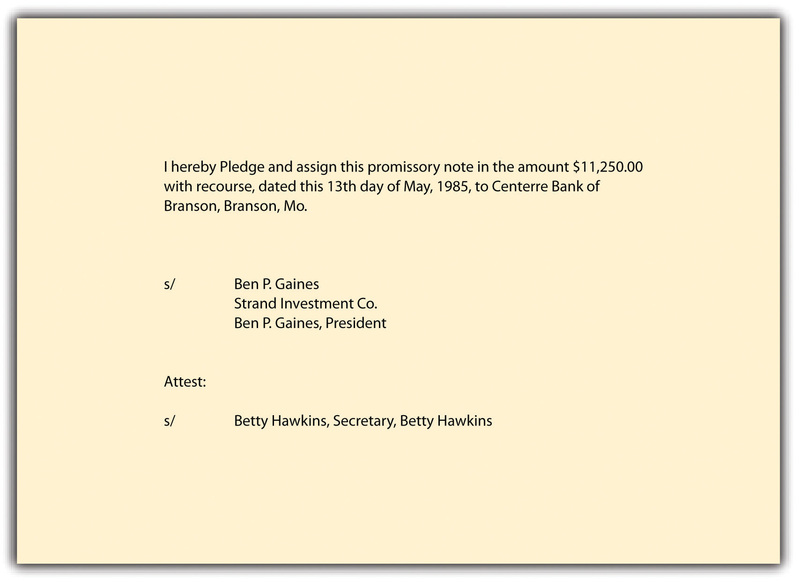 The signed draft is the banker’s acceptance (see Figure 19.3 "A Time Draft"). It is returned to the bank in Taiwan, which can then discount the banker’s acceptance if it wishes payment immediately or else wait the ninety days to present it to the New York bank for payment. After remitting to the Taiwanese bank, the New York bank then demands payment from Love. A note—often called a promissory noteA written promise to pay or repay a specified sum of money at a stated time or on demand.—is a written promise to pay a specified sum of money on demand or at a definite time. There are two parties to a note: the makerA party that signs a promissory note. (promisor), and the payeeThe person who is to receive payment on a draft or note. (promisee). 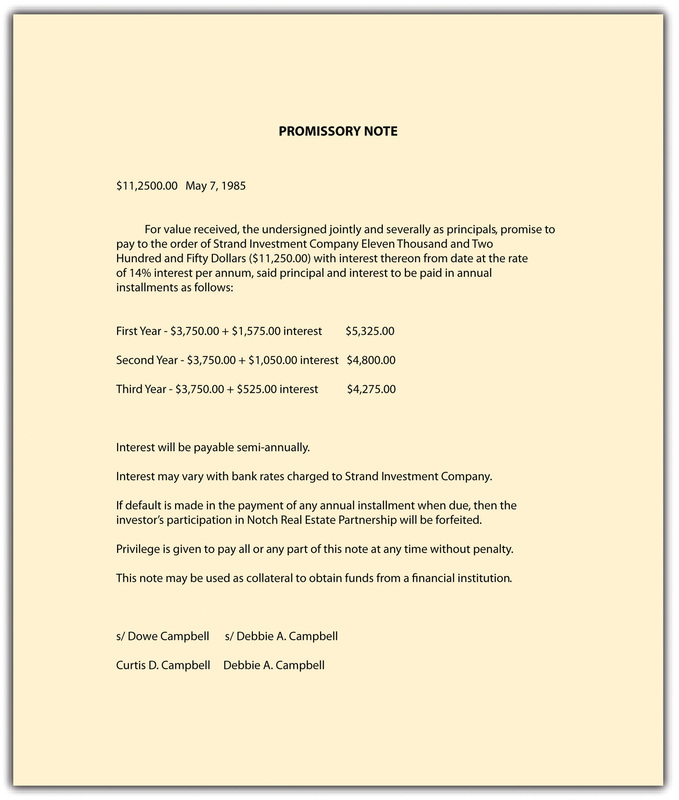 For an example of a promissory note, see Figure 19.4 "A Promissory Note". The maker might execute a promissory note in return for a money loan from a bank or other financial institution or in return for the opportunity to make a purchase on credit. A holder in due courseGood-faith holder who has taken a negotiable instrument for value, without notice that it was overdue or had been dishonored or that there was any defense against or claim to it. is a special type of holder who, if certain requirements are met, acquires rights beyond those possessed by the transferor (we alluded to this in describing the significance of Lorna Love’s making of a negotiable—as opposed to a nonnegotiable—instrument). We discuss the requirements for a holder in due course in Chapter 21 "Holder in Due Course and Defenses". An accommodation partyOne who signs an instrument as drawer, indorser, or acceptor to help another raise money. is one who signs a negotiable instrument in order to lend her name to another party to the instrument. It does not matter in what capacity she signs, whether as maker or comaker, drawer or codrawer, or indorser. As a signatory, an accommodation party is always a surety (Chapter 23 "Legal Aspects of Banking"; a surety is one who guarantees payment if the primarily obligated party fails to pay). The extent of the accommodation party’s liability to pay depends on whether she has added language specifying her purposes in signing. Section 3-416 of the UCC distinguishes between a guaranty of payment and a guaranty of collection. An accommodation party who adds words such as “payment guaranteed” subjects herself to primary liability: she is guaranteeing that she will pay if the principal signatory fails to pay when the instrument is due. But if the accommodation party signs “collection guaranteed,” the holder must first sue the maker and win a court judgment. Only if the judgment is unsatisfied can the holder seek to collect from the accommodation party. When words of guaranty do not specify the type, the law presumes a payment guaranty. Know what is required for an instrument to be negotiable. It must be signed by the maker or drawer. It must be an unconditional promise or order to pay. It must be for a fixed amount in money. It must be payable on demand or at a definite time. It must be payable to order or bearer, unless it is a check. This definition states the basic premise of a negotiable instrument: the holder must be able to ascertain all essential terms from the face of the instrument. Under UCC Section 1-201, “written” or “writing” includes “printing, typewriting or any other intentional reduction to tangible form.” That definition is broad—so broad, in fact, that from time to time the newspapers report checks written on material ranging from a girdle (an Ohio resident wanted to make his tax payment stretch) to granite. Since these are tangible materials, the checks meet the writing requirement. The writing can be made in any medium: ink, pencil, or even spray paint, as was the case with the granite check. Of course, there is a danger in using pencil or an ink that can be erased, since the drawer might be liable for alterations. For example, if you write out in pencil a check for $10 and someone erases your figures and writes in $250, you may lose your right to protest when the bank cashes it. Section 3-106(a) of the UCC provides that an instrument is not negotiable if it “states (i) an express condition to payment, (ii) that the promise or order is subject to or governed by another writing, or (iii) that rights or obligations with respect to the promise or order are stated in another writing. A reference to another writing does not of itself make the promise or order conditional.” Under 3-106(b), a promise is not made conditional by “(i) reference to another writing for a statement of rights with respect to collateral, pre-payment, or acceleration, or (ii) because payment is limited to resort to a particular fund or source.” As to “reference to another writing,” see Holly Hill Acres, Ltd. v. Charter Bank of Gainesville, in Section 19.4 "Cases". The only permissible promise or order in a negotiable instrument is to pay a sum certain in money. Any other promise or order negates negotiability. The reason for this rule is to prevent an instrument from having an indeterminate value. The usefulness of a negotiable instrument as a substitute for money would be seriously eroded if the instrument’s holder had to investigate whether a stipulation or condition had been met before the thing had any value (i.e., before the obligor’s obligation to pay ripened). The value of the paper must be fixed (specific) so it can be ascertained, and it must be payable in money. The instrument must recite an exact amount of money that is to be paid, although the exact amount need not be expressed in a single figure. For example, the note can state that the principal is $1,000 and the interest is 11.5 percent, without specifying the total amount. Or the note could state the amount in installments: twelve equal installments of $88.25. Or it could state different interest rates before and after a certain date or depending on whether or not the maker has defaulted; it could be determinable by a formula or by reference to a source described in the instrument.Uniform Commercial Code, Section 3-112(b). It could permit the maker to take a discount if he pays before a certain date or could assess a penalty if he pays after the date. It could also provide for an attorney’s fees and the costs of collection on default. If it is clear that interest is to be included but no interest amount is set, UCC Section 3-112 provides that it is “payable at the judgment rate in effect at the place of payment of the instrument and at the time interest first accrues.” The fundamental rule is that for any time of payment, the holder must be able to determine, after the appropriate calculations, the amount then payable. See Section 19.4 "Cases", Centerre Bank of Branson v. Campbell, for a case involving the “fixed amount” rule. Is the note “Payable ten days after I give birth” negotiable? No, because the date the baby is due is uncertain. Is the note “Payable on January 1, but if the Yankees win the World Series, payable four days earlier” negotiable? Yes: this is a valid acceleration clause attached to a definite date. An instrument payable to order is one that will be paid to a particular person or organization identifiable in advance. To be payable to order, the instrument must so state, as most ordinarily do, by placing the words “payable to order of” before the name of the payee. An instrument may be payable to the order of the maker, drawer, drawee, or someone else. It also may be payable to the order of two or more payees (together or in the alternative), to an estate, a trust, or a fund (in which case it is payable to the representative, to an office or officer, or to a partnership or unincorporated association). Suppose a printed form says that the instrument is payable both to order and to bearer. In that event, the instrument is payable only to order. However, if the words “to bearer” are handwritten or typewritten, then the instrument can be payable either to order or to bearer. A negotiable instrument not payable to a particular person must be payable to bearer, meaning to any person who presents it. To be payable to bearer, the instrument may say “payable to bearer” or “to the order of bearer.” It may also say “payable to John Doe or bearer.” Or it may be made payable to cash or the order of cash. Also affecting this policy is the fact that almost all checks are now read by machines, not human beings. There is no one to see that the printed form does not contain the special words, and the significance of the words is recognized by very few people. In short, it doesn’t matter for checks. The rules just stated make up the conditions for negotiability. Dealing with two additional details—missing terms or ambiguous terms—completes the picture. Notwithstanding the presence of readily available form instruments, sometimes people leave words out or draw up confusing documents. An incomplete instrument—one that is missing an essential element, like the due date or amount—can be signed before being completed if the contents at the time of signing show that the maker or drawer intends it to become a negotiable instrument. Unless the date of an instrument is required to determine when it is payable, an undated instrument can still be negotiable.Uniform Commercial Code, Section 3-113(b). Otherwise, to be enforceable, the instrument must first be completed—if not by the maker or drawer, then by the holder in accordance with whatever authority he has to do so.Uniform Commercial Code, Section 3-115. See the case presented in Section 19.4 "Cases", Newman v. Manufacturers Nat. Bank of Detroit. When it is unclear whether the instrument is a note or draft, the holder may treat it as either. Handwritten terms control typewritten and printed terms, and typewritten terms control printed terms. Words control figures, unless the words themselves are ambiguous, in which case the figures control. If the instrument contains a “conspicuous statement, however expressed, to the effect that the promise or order is not negotiable,” its negotiability is destroyed, except for checks, and “an instrument may be a check even though it is described on its face by another term, such as ‘money order.’”Uniform Commercial Code, Section 3-104(d); Uniform Commercial Code, Section 3-104(f). If an instrument is not negotiable, it generally will not be acceptable as payment in commercial transactions. The UCC requires that the value of a negotiable instrument be ascertainable on its face, without reference to other documents. Thus the negotiable instrument must be in writing, signed by the maker or drawer, an unconditional promise or order to pay, for a fixed amount in money, payable on demand or at a definite time, and payable to order or bearer, unless it is a check. If the instrument is incomplete or ambiguous, the UCC provides rules to determine what the instrument means. Why does the UCC require that the value of a negotiable instrument be ascertainable from its face, without extrinsic reference? What are the six requirements for an instrument to meet the negotiability test? Why are the words “pay to order” or “pay to bearer” or similar words required on negotiable instruments (except for checks—and why not for checks)? If an instrument is incomplete, is it invalid? Appellant/defendant [Holly Hill] appeals from a summary judgment in favor of appellee/plaintiff Bank in a suit wherein the plaintiff Bank sought to foreclose a note and mortgage given by defendant. 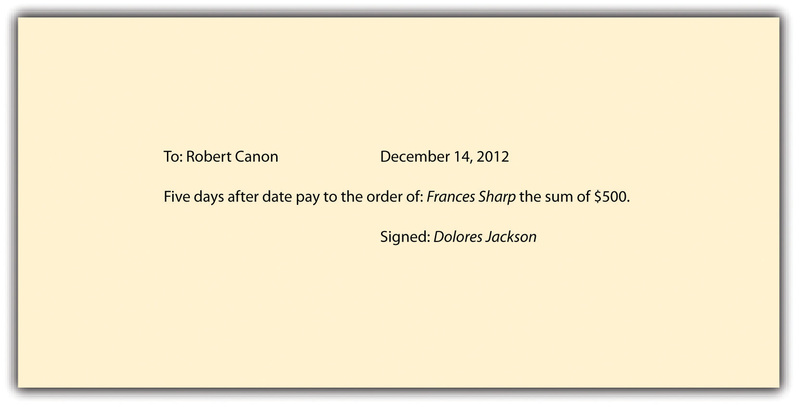 Rogers and Blythe assigned the promissory note and mortgage in question to the plaintiff Bank to secure their own note. Plaintiff Bank sued defendant [Holly Hill] and joined Rogers and Blythe as defendants alleging a default on their note as well as a default on defendant’s [Holly Hill’s] note. Defendant answered incorporating an affirmative defense that fraud on the part of Rogers and Blythe induced the sale which gave rise to the purchase money mortgage. Rogers and Blythe denied the fraud. In opposition to plaintiff Bank’s motion for summary judgment, the defendant submitted an affidavit in support of its allegation of fraud on the part of agents of Rogers and Blythe. The trial court held the plaintiff Bank was a holder in due course of the note executed by defendant and entered a summary final judgment against the defendant. The note having incorporated the terms of the purchase money mortgage was not negotiable. The plaintiff Bank was not a holder in due course, therefore, the defendant was entitled to raise against the plaintiff any defenses which could be raised between the appellant and Rogers and Blythe. Since defendant asserted an affirmative defense of fraud, it was incumbent on the plaintiff to establish the non-existence of any genuine issue of any material fact or the legal insufficiency of defendant’s affirmative defense. Having failed to do so, plaintiff was not entitled to a judgment as a matter of law; hence, we reverse. Plaintiff Bank relies upon Scott v. Taylor [Florida] 1912 [Citation], as authority for the proposition that its note is negotiable. Scott, however, involved a note which stated: “this note secured by mortgage.” Mere reference to a note being secured by mortgage is a common commercial practice and such reference in itself does not impede the negotiability of the note. There is, however, a significant difference in a note stating that it is “secured by a mortgage” from one which provides, “the terms of said mortgage are by this reference made a part hereof.” In the former instance the note merely refers to a separate agreement which does not impede its negotiability, while in the latter instance the note is rendered non-negotiable. Accordingly, the entry of a summary final judgment is reversed and the cause remanded for further proceedings. What was wrong with the promissory note that made it nonnegotiable? How did the note’s nonnegotiability—as determined by the court of appeals—benefit the defendant, Holly Hill? The court determined that the bank was not a holder in due course; on remand, what happens now? “1. …on [May 7,] 1985, the [Campbells] made and delivered to Strand…their promissory note…and thereby promised to pay to Strand…or its order…($11,250.00) with interest thereon from date at the rate of fourteen percent (14%) per annum; that a copy of said promissory note is attached hereto…and incorporated herein by reference. Centerre’s petition went on to allege that default had been made in payment of the note and that there was an unpaid principal balance of $9,000, plus accrued interest, due thereon. Centerre’s petition prayed for judgment against the Campbells for the unpaid principal and interest. Neither side has cited a Missouri case applying [UCC 3-104(a)] to a note containing a provision similar to: “Interest may vary with bank rates charged to Strand.” Our independent research has likewise proven fruitless. There are, however, instructive decisions from other jurisdictions. In Taylor v. Roeder, [Citation, Virginia] (1987), a note provided for interest at “[t]hree percent (3.00%) over Chase Manhattan prime to be adjusted monthly.” A second note provided for interest at “3% over Chase Manhattan prime adjusted monthly.” Applying sections of the Uniform Commercial Code adopted by Virginia identical to [the Missouri UCC], the court held the notes were not negotiable instruments in that the amounts required to satisfy them could not be ascertained without reference to an extrinsic source, the varying prime rate of interest charged by Chase Manhattan Bank. In A. Alport & Son, Inc. v. Hotel Evans, Inc., [Citation] (1970), a note contained the notation “with interest at bank rates.” Applying a section of the Uniform Commercial Code adopted by New York identical to [3-104(a)] the court held the note was not a negotiable instrument in that the amount of interest had to be established by facts outside the instrument. In the instant case, the Campbells insist that it is impossible to determine from the face of the note the amount due and payable on any payment date, as the note provides that interest may vary with bank rates charged to Strand. Consequently, say the Campbells, the note is not a negotiable instrument, as it does not contain a promise to pay a “sum certain” [UCC 3-104(a)]. An alert reader will have noticed two other extraordinary features about the note, not mentioned in this opinion. First, the note provides in one place that principal and interest are to be paid in annual installments; in another place it provides that interest will be payable semiannually. Second, there is no acceleration clause providing that if default be made in the payment of any installment when due, then all remaining installments shall become due and payable immediately. It would have thus been arguable that, at time of trial, only the first year’s installment of principal and interest was due. No issue is raised, however, regarding any of these matters, and we decline to consider them sua sponte [on our own]. What was defective about this note that made it nonnegotiable? What was the consequence to Centerre of the court’s determination that the note was nonnegotiable? What did the Campbells give the note for in the first place, and why do they deny liability on it? (a) An instrument may be antedated or postdated. Plaintiff admitted at trial that defendant acted in good faith in honoring the two checks of plaintiff’s in question, and therefore defendant’s good faith is not in issue. (2) the tenor of his completed item, even though the bank knows the item has been completed unless the bank has notice that the completion was improper. …[W]e conclude it was shown that two checks were issued by plaintiff in 1955, filled out but for the dates which were subsequently completed by the payee or someone else to read April 16, 1964, and presented to defendant bank for payment, April 22, 1964. Applying the rules set forth in the UCC as quoted herein, the action of the defendant bank in honoring plaintiff’s checks was in good faith and in accord with the standard of care required under the UCC. Since we have determined that there was no liability under the UCC, plaintiff cannot succeed on this appeal. Why does handwriting control over printing or typing on negotiable instruments? How could the plaintiff have protected himself from liability in this case? Commercial paper is the collective term for a variety of instruments—including checks, certificates of deposit, and notes—that are used to pay for goods; commercial paper is basically a contract to pay money. The key to the central role of commercial paper is negotiability, the means by which a person is empowered to transfer to another more than what the transferor himself possesses. The law regulating negotiability is Article 3 of the Universal Commercial Code. Commercial paper can be divided into two basic types: the draft and the note. A draft is a document prepared by a drawer ordering the drawee to remit a stated sum of money to the payee. Drafts can be subdivided into two categories: sight drafts and time drafts. A note is a written promise to pay a specified sum of money on demand or at a definite time. 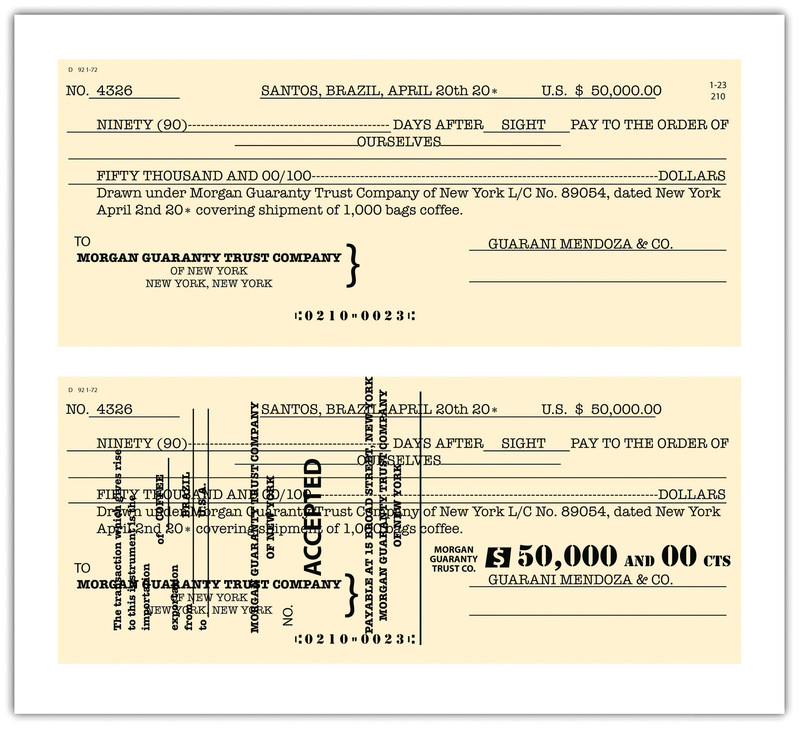 A special form of draft is the common bank check, a draft drawn on a bank and payable on demand. A special form of note is the certificate of deposit, a written acknowledgment by a bank that it has received money and agrees to repay it at a time specified in the certificate. In addition to drawers, makers, drawees, and payees, one can deal with commercial paper in five other capacities: as indorsers, indorsees, holders, holders in due course, and accommodation parties. A holder of a negotiable instrument must be able to ascertain all essential terms from its face. These terms are that the instrument (1) be in writing, (2) be signed by the maker or drawer, (3) contain an unconditional promise or order to pay (4) a sum certain in money, (5) be payable on demand or at a definite time, and (6) be payable to order or to bearer. If one of these terms is missing, the document is not negotiable, unless it is filled in before being negotiated according to authority given. Golf Inc. manufactures golf balls. Jack orders 1,000 balls from Golf and promises to pay $4,000 two weeks after delivery. Golf Inc. delivers the balls and assigns its contract rights to First Bank for $3,500. Golf Inc. then declares bankruptcy. May First Bank collect $3,500 from Jack? Explain. Assume in problem 1 that Jack gives Golf Inc. a nonnegotiable note for $3,500 and Golf sells the note to the bank shortly after delivering the balls. May the bank collect the $3,500? Would the result be different if the note were negotiable? Explain. George decides to purchase a new stereo system on credit. He signs two documents—a contract and a note. The note states that it is given “in payment for the stereo” and “if stereo is not delivered by July 2, the note is cancelled.” Is the note negotiable? Explain. Is the following instrument a note, check, or draft? Explain. Lou enters into a contract to buy Alan’s car and gives Alan an instrument that states, “This acknowledges my debt to Alan in the amount of $10,000 that I owe on my purchase of the 2008 Saturn automobile I bought from him today.” Alan assigns the note to Judy for $8,000. Alan had represented to Lou that the car had 20,000 miles on it, but when Lou discovered the car had 120,000 miles he refused to make further payments on the note. Can Judy successfully collect from Lou? Explain. The same facts as above are true, but the instrument Lou delivered to Alan reads, “I promise to pay to Alan or order $10,000 that I owe on my purchase of the 2008 automobile I bought from him today.” Can Judy successfully collect from Lou? Explain. Joe Mallen, of Sequim, Washington, was angry after being cited by a US Fish and Wildlife Service for walking his dog without a leash in a federal bird refuge. He was also aggravated with his local bank because it held an out-of-state check made out to Mallen for ten days before honoring it. To vent his anger at both, Mallen spray painted a twenty-five-pound rock from his front yard with three coats of white paint, and with red paint, spelled out his account number, the bank’s name, the payee, his leash law citation number, and his signature. Should the US District Court in Seattle—the payee—attempt to cash the rock, would it be good? Explain.Joel Schwarz, “Taking Things for Granite,” Student Lawyer, December 1981. Raul Castana purchased a new stereo system from Eddington Electronics Store. He wrote a check on his account at Silver Bank in the amount of $1,200 and gave it to Electronics’ clerk. David Eddington, the store owner, stamped the back of the check with his rubber indorsement stamp, and then wrote, “Pay to the order of City Water,” and he mailed it to City Water to pay the utility bill. Designate the parties to this instrument using the vocabulary discussed in this chapter. Would Castana’s signed note made out to Eddington Electronics Store be negotiable if it read, “I promise to pay Eddington’s or order $1,200 on or before May 1, 2012, but only if the stereo I bought from them works to my satisfaction”? Explain. And—disregarding negotiability for a moment—designate the parties to this instrument using the vocabulary discussed in this chapter. A “maker” in negotiable instrument law does what?